Exciting news here at SeaWorld - - I wanted to share it with those of you who have partnered with me through the years, on our mission to care for this beautiful planet. Your support is appreciated, as together we can inspire the next generation of ocean protectors. Over the past 50 years, SeaWorld has worked tirelessly to improve the lives of marine animals and protect the health of our oceans. We have forged new partnerships, made strides in research to improve the health and habitats of wild animals, developed cutting edge animal rehabilitation programs and emerged as one of the leading animal rescue organizations in the United States. We have also added amazing entertainment, attractions and experiences – all with the goal of ensuring every guest interaction with SeaWorld is both fun and meaningful. This past weekend we launched SeaWorld’s new Park to Planet commercial spot on the world’s biggest stage, the NBC Winter Games. Park to Planet is a way to give a voice to the great work SeaWorld and its partners are doing to make a difference for the planet. Through Park to Planet, we want to inspire others to join our shared mission to save the animals and the oceans we all call home. Every visit to our parks makes a difference and helps to support our wider animal rescue (over 31,000 rescued!) and conservation efforts. We are proud to share a special message from our ambassadors, and in case you haven’t seen it, our new commercial spot. Please also visit parktoplanet.com where we encourage you to learn more and share details on our mission and work. NEW YORK – November 2, 2017 – Siestas are key, especially in the fast-paced lives of some of the world’s most active animals. The fascinating sleeping habits of the animal kingdom hint at a complexity humans are only just beginning to unlock. From birds that take micro-naps mid-flight to dolphins who half-snooze while underwater, Smithsonian Earth examines the myriad ways animals sleep with the new animated, short-form series, THE SECRET WORLD OF ANIMAL SLEEP. Narrated by journalist and science communicator Cara Santa Maria, this new series offers a captivating glimpse into the way animals restore energy and get ready for their next day or night on the prowl – all through a series of beautiful picture-book, hand-drawn animations. The premiere episode, SLEEPLESS ON THE SAVANNA, is now available for free at SmithsonianEarthTV.com/Sleep. The five additional episodes will be available on Smithsonian Earth tomorrow, November 3rd. Smithsonian Earth is available on Apple®, Roku®, Amazon, Android™ and SmithsonianEarthTV.com. The higher up on the food chain you are, the more sleep you get. That’s why prey species like giraffes can only afford mere minutes of sleep at a time, while lions revel in over 20 hours of luxurious slumber a day. Take an eye-opening look at sleep as a survival strategy. Marine mammals like dolphins need air to breathe, but what happens when they rest? The solution is a fascinating form of half-sleep that allows them to emerge for air without waking up. Dive into the weird world of underwater slumber. When birds need sleep, they do it on the fly – quite literally. They’re able to enter a special kind of half-sleep state that lets them rest midair, which is especially important for migratory birds, like the Alpine swift, clocking thousands of miles at a time. Glide into the astounding world of avian sleep. Owls and foxes are born with undeveloped brains. To grow, they need a special kind of deep sleep known as REM, or rapid eye movement – a state marked by brain regeneration, memory development and a lot of movement. Take an intriguing look into the role of sleep in helping different species develop into adults. Arctic ground squirrels survive harsh Canadian winters through skilled hibernation. Entering a state of controlled hypothermia, their body temperatures drop to 27°F – the lowest ever recorded in a mammal. This suspended animation isn’t sleep exactly, but it’s an equally vital part of their unique survival plan. All animals sleep – but few do so in exactly the same way. Horses snooze standing up and snakes sleep with their eyes wide open. As for some species of jellyfish, they sleep despite lacking a brain. Uncover some of the more unusual features of animal slumber, many of which still remain a mystery. Cara Santa Maria is a Los Angeles Area Emmy and Knight Foundation Award winning journalist, science communicator, television personality, producer and podcaster. She is the creator and host of a weekly science podcast called Talk Nerdy with Cara Santa Maria and cohosts the popular Skeptics' Guide to the Universe podcast. She is a founding member of the Nerd Brigade and cofounded the annual science communication retreat #SciCommCamp. Smithsonian Earth is a subscription streaming video service specializing in original nature and wildlife programming shot in stunning 4K Ultra HD resolution that’s available through Apple®, Roku®, Amazon, Android™ and at SmithsonianEarthTV.com. Smithsonian Networks™ is a joint venture between Showtime Networks Inc. and the Smithsonian Institution. Smithsonian Networks operates Smithsonian Earth, through SN Digital LLC. Smithsonian Networks also operates Smithsonian Channel, the place for awe-inspiring stories, powerful documentaries and amazing entertainment across multiple platforms. To learn more, go to www.smithsonianchannel.com, or connect with us on Facebook, //twitter.com/@SmithsonianChan">Twitter, and Instagram. Clearwater Marine Aquarium (CMA) is not your typical aquarium. Located on Clearwater’s Island Estates, the establishment works as an animal hospital with the mission of the rescue, rehabilitation and release of marine life. 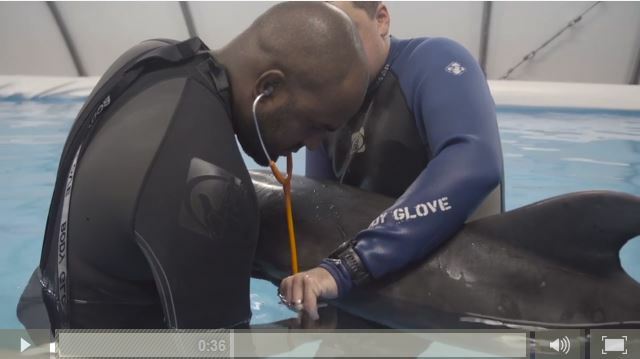 The story of the rescue and rehabilitation of Clearwater Marine Aquarium’s permanent residents Winter and Hope, both Atlantic bottlenose dolphins, has inspired millions around the world through the movies Dolphin Tale and Dolphin Tale 2. Winter was found stranded in Mosquito Lagoon, near Cape Canaveral, Florida when she was only two months old, entangled in a crab trap line which cut off circulation to her tail flukes. After disentanglement, she was transported to Clearwater Marine Aquarium for treatment of her extensive injuries. However, despite exhaustive efforts to promote healing, her tail deteriorated and could not be saved. Hanger Prosthetics and Orthotics, Inc., together with CMA staff, created a unique plan to attach a prosthetic tail to Winter. Her story has inspired millions around the world with the message of perseverance and hope. People relate to the strength it takes to overcome obstacles, as brave animals exemplify that every day. By inviting guests to see firsthand how CMA cares for these animals, they create powerful experiences that can change lives and make a difference. CMA staff and volunteers work each day to rescue marine life and provide the most advanced and effective care to maximize the opportunity to return sick or injured animals to their homes. The animals at Clearwater Marine Aquarium arrive because they are suffering from an illness or severe injury. Once an animal arrives at CMA, a team of experienced staff biologists, veterinarians and volunteers create a rehabilitation plan specifically developed based on its injury or illness, with the goal of returning it to the wild. Sometimes the injuries are so severe, or the animal is so young, that it would not be in the animal’s best interest to release it back into the wild. CMA works with agencies such as National Marine Fisheries and Florida Fish and Wildlife Conservation Commission to make these decisions. If the animal is unable to be released back into the wild, it becomes a permanent member of the CMA family, and lives there to serve as an ambassador for its species to help promote environmental conservation. Clearwater Marine Aquarium’s Education Department is dedicated to inspiring guests of all ages to appreciate the marine environment while promoting conservation. The team strives to develop an understanding for the irreplaceable value of all marine life. By teaching children and adults the importance of conservation, ecology and stewardship, CMA believes they will apply this knowledge to make sustainable choices and take an active part in preserving the marine environment. (Grand Isle, La.) 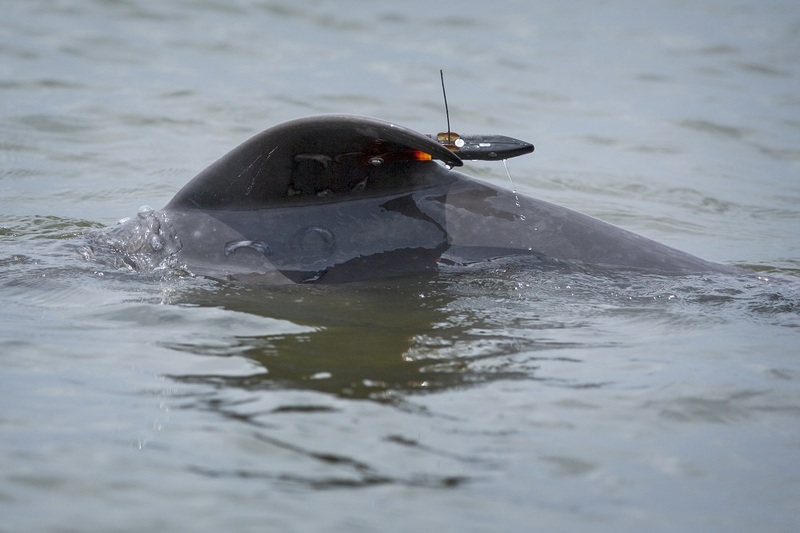 – Today, Audubon Nature Institute and the Louisiana Department of Wildlife and Fisheries in coordination with NOAA's National Marine Fisheries Service and Chicago Zoological Society's Sarasota Dolphin Research Program released a juvenile male dolphin into Barataria Bay. 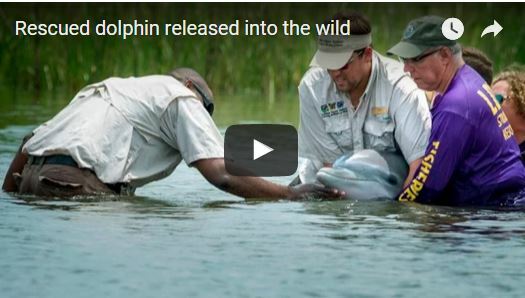 The dolphin is the first to be rescued, rehabilitated and released back into the wild off Louisiana’s coast. “It’s unknown how long the animal was on the beach before he was discovered, but that period of time was a definite strain on him,” said Tumlin. “Dolphins are accustomed to buoyancy when in the water, so there is significant strain on their muscles when the animal is stranded and take on their entire body weight." 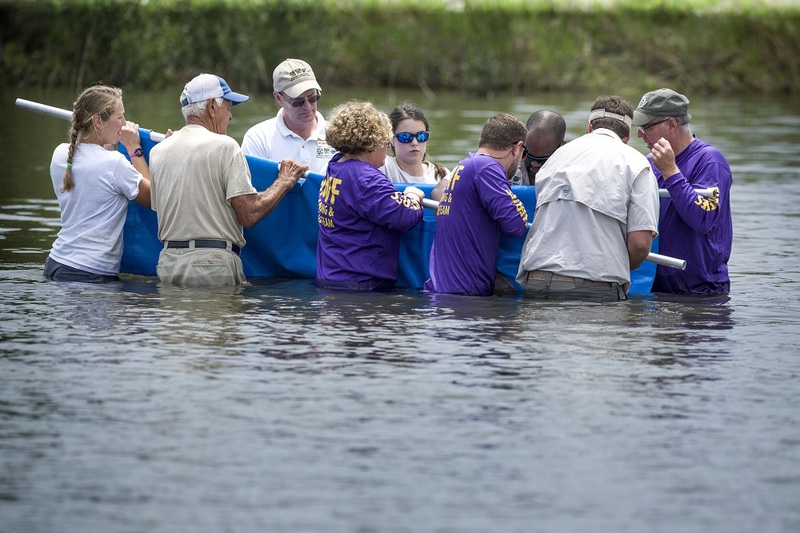 "Audubon and LDWF have been working tirelessly to care for Octavius," said Vazquez. "While there is still more critical work to be done with post-release monitoring, we have given this animal the best chance for a successful return to the wild." “This is one of the latest in a series of successful stranding network rescues across the country,” said Audubon Nature Institute President and CEO Ron Forman. The Association of Zoos and Aquariums facilities make up roughly 25 percent of non-governmental response partners. According to NOAA, “Over the last decade, 7,979 marine mammal standings have been reported in the Southeast region with an average of 798 strandings per year." The public can contact LDWF’s stranding hotline at (337) 962-7092 or Audubon Coastal Wildlife at (504) 235-3005 if they encounter an injured or stranded (live or dead) marine mammal or sea turtle or report strandings through NOAA's Dolphin & Whale 911 app for your smartphone (http://1.usa.gov/1b1kqfv). Warner Bros. Pictures, Alcon Entertainment, Boxing Cat Films and Color Force present a 107 minute, PG, Family, Drama, directed by Charles Martin Smith, written by Smith and Karen Janszen with a theater release date of September 12, 2014. Dolphins aren’t just beloved, they are brilliant and conscious. So why do we treat them so terribly? Diana Reiss is one of the world’s leading experts on dolphin intelligence. In addition, as a dolphin advocate, she is a leading rescuer who helped inspire and served as an adviser for the Oscar-winning film The Cove. Here, she combines her science and activism to show just how smart dolphins really are and why we must stop mistreating them. Readers will be astonished at their sophisticated lifelong creativity and playfulness, their emotional intelligence, their level of self-awareness, and their ability to communicate with humans. Her beloved mentor dolphins (as she calls them), each with distinct personalities, create their own toys, use underwater keyboards, tease and scold her playfully, and give us glimpses of their intelligence that often seem very familiar. The Dolphin in the Mirror is both a scientific revelation and an emotional eye-opener, revealing one of the greatest intelligences on the planet.